The Book Chook: Children’s Book Review, Magnificent Creatures: Animals on the Move! Children’s Book Review, Magnificent Creatures: Animals on the Move! 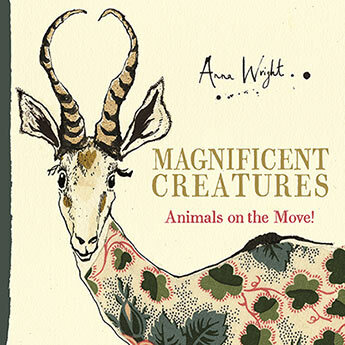 Anna Wright's stunning introduction to non-fiction and the natural world is enlivened by her gorgeously sophisticated and fun art style which mixes pen and ink, watercolour and fabric collage. Find out what 'pronking' is and how one jellyfish can become two in the humorous descriptions. Both educational and beautiful Anna's unique picture book shows the character of these animals beyond their familiar forms. While these rich, textured and at times whimsical illustrations add humour and energy to the book, the chosen text is fact-based. However, these are not dry, dusty facts. Wright has carefully chosen information that will grab a young reader’s interest. The animals chosen are varied - we meet crabs from Christmas Island, Southern Carmine Bee Eaters from Africa, springbok and starlings. Wright advises readers to keep watch for animals large and small - “See if you can spot them wiggle, shimmer or dance.” - and reminds us that “We truly do live in a magical world.” That magic, along with joy and drama, is certainly celebrated in Magnificent Creatures: Animals on the Move! I believe it's a wonderful resource for libraries looking for books that are both educational and beautiful.